"... i am impressed... strength and size... "
"... My biggest thing with betashock is the increase in pump. The strength I think comes from your diet and focus in the gym which a pill can't give you. But the blood flow is controlled by ingredients and with this one it's extremely noticeable. I use it for each workout now as I really gives me a bigger sense of accomplishment and connection with the muscle at work. If anyone has heard of the mind-muscle connection, well having a good pump is a huge part of it as you go from set to set." "... Betashock is actually one of the few supplements out there on the market that WORKED EXACTLY as it claims - and trust me in this industry of hype and marketing lies, that is a very good thing. Been using betashoch based on that success for a few months now and still enjoying great results." "... it didnt work for me, bodies are different maybe it'll work for you"
"... I've noticed since supplementing with betashock that my strength has gone up significantly." 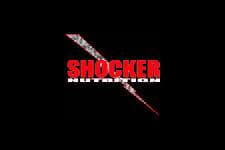 Shocker Nutrition - BetaShock Formula! 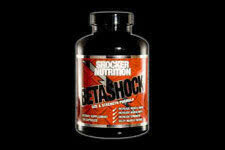 Betashock by Shocker Nutrition is the key formula to maximize and maintain size & strength! Shocker nutrition has maintained its competitive and scientific edge in the sports supplements industry, it's latest product is the best one yet - BetaSHOCK! Beta shock is the exact formula to significantly raise your strength levels at the gym, increase your overall lean muscle mass, pump up vascularity for that lean and ripped appearance and finally, improve you recovery by delaying the onset of muscle fatigue. Don't let anything slow you down, reach your goals fast with betashock! 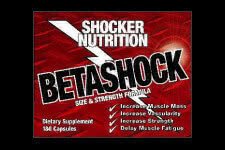 BetaShock will increase Lean Muscle Mass & Bulging Vascularity! WOW - Dramatically raise your Strength and Delay Muscle Fatigue!